Pastoral ministry is much different now, in the twenty-first century, than it was a hundred or even fifty years ago. Certainly, pastoral ministry is still the same at its core: preaching the truths of the Bible to God’s people. But as our cultural context changes, active pastors and seminarians need guidance in addressing uniquely twenty-first-century issues. That’s where Pastoral Ministry comes into play. This forthcoming book, written by Dr. Richard H. Warneck, speaks to the struggles, disappointments, frustrations, and failings of parish ministry. But at the same time, it inspires and restores the vision of parish ministry. As the gulf between American culture and Christianity widens, new and experienced pastors alike need wise counsel on how to address this cultural shift. Dr. Warneck, who served at Concordia Seminary in St. Louis as the director of vicarage and field education, understands the culture we send our pastors into. His work in Pastoral Ministry speaks to that culture, while holding fast to the descriptions of the pastoral ministry found first in Scripture and then in the Lutheran Confessions. You can read a free excerpt of Pastoral Ministry by filling out the form below. Q&A with Rev. Matthew Harrison and Rev. John Pless, General Editors of Closed Communion? Rev. Matthew Harrison and Rev. John Pless teamed up together to offer the Church a wonderful collection of essays that brings together the best of the old and the new on the topic of closed Communion. Featuring essays from Luther, Elert, Sasse, Pieper, and a variety of contemporary authors—including practical essays that address today’s ministry context—this book serves to assist pastors and laity in understanding the biblical and confessional basis for closed Communion. We recently caught up with Rev. Harrison and Rev. Pless to talk about their new book, Closed Communion? 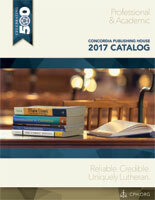 Admission to the Lord’s Supper in Biblical Lutheran Perspective, now available at cph.org. What can readers expect in this volume? Closed Communion is the historical practice of the Lutheran Church, so we’ve tried to let Lutherans, beginning with Luther, speak on this topic. In the nineteenth century, pressures toward unionism were especially strong, so we have a number of articles by theologians such as Walther, Loehe, and Zezchwitz. Many of the essays are from the great champions of Lutheran doctrine in the twentieth century, such as Elert, Sasse, Hardt, Hopf, and Pieper. There are also essays by living theologians. There is a good balance between exegetical, doctrinal, historical, and practical topics. Why is it important that essays included in this book are both old and new? Who did you have in mind while compiling this collection of essays? We thought of several audiences. First and foremost, there are parish pastors who have the weighty responsibility before God as stewards of His Means of Grace. They are on the front line and need to be able to clearly articulate what our church teaches and why it does so on the basis of the Scriptures. It will certainly fill a gap as a textbook in our seminaries. District presidents who are responsible for ecclesiastical supervision will find it immensely useful in their work. Lay leaders who want to better understand our church’s practice will have a “go-to” resource. I think it will also serve an ecumenical purpose in giving a biblical, historical, and doctrinal basis for our confessional position. Why is it important that all Christians—whether or not their churches practice closed Communion—have a proper understanding of closed Communion? Dr. Luther reminds us that it “is the Lord’s Supper, not the Christian’s Supper.” We practice closed Communion because we confess that in this Sacrament we eat and drink with our mouths the very body and blood of Christ. The apostle Paul warns all Christians in 1 Corinthians about the spiritual danger involved to those who eat and drink the Lord’s body and blood without discerning His bodily presence. Christians from churches that practice open communion need to be challenged with the biblical and historical evidence. How do you see the faithful practice of closed Communion being challenged today both culturally and ecclesiastically? Culturally, we are adrift in a world that accents autonomy. Each person is thought to be entitled for him or herself what he or she will participate in spiritually. Ours is an individualistic age that fails to see the communal dimension of faith. In the Lord’s Supper, Christ is dealing with us both individually and corporately. Closed Communion affirms this, open Communion does not. We are also faced with what has been called “denominational ambiguity.” People move easily and often without much thought to doctrine from one church to another. It is for these reasons that the practice of closed Communion is especially important today. Even in conservative Lutheran churches, these cultural and ecclesiastical themes are having an impact. Where does closed Communion find its origins? It is a biblical practice, as we can see from the apostle Paul’s extended discussion of the Lord’s Supper in 1 Corinthians. The great theologian of the last century, Werner Elert, has convincingly demonstrated that closed Communion was the practice of the Early Church. We have several of his essays in the book. The practice of closed Communion was common throughout the Christian church until the nineteenth century. It begins to break down under Pietism and unionism in Europe and attempts to avoid “denominationalism” in North America with the founding of such groups as the Disciples of Christ. Let’s talk about some practical applications regarding this practice. What are some ways a church can clearly articulate its beliefs about Communion in a way that visitors can understand this practice? A brief statement in the worship folder is helpful. Such a statement should not be too wordy or complex. It should succinctly state that visitors should speak with the pastor before communing. In some settings, an oral announcement is a good thing. Laity should be well-catechized regarding the Lord’s Supper, so they are in a good position to explain to their visiting friends and relatives why it is that we practice closed Communion. In this regard, we’re pleased that the forthcoming synodical explanation of Luther’s Small Catechism has a more complete section on closed Communion. Our book will be a resource for more articulate catechetical instruction. The practice of closed Communion does not deny the saving faith of individuals who are not communicants. In fact, the faithful practice of closed Communion is really an invitation to come and learn the “all things” that our Lord gives His disciples to teach in Matthew 28 so that they can be one with Him and us at His altar. To order your copy of Closed Communion? Admission to the Lord’s Supper in Biblical Lutheran Perspective, visit cph.org or call 800-325-3040. Following closely on the heels of the commentary on 1 Samuel, the next volume of the Concordia Commentary series will be 2 Samuel. Andrew Steinmann, author of 1 Samuel as well as Daniel, Proverbs, and Ezra and Nehemiah in the Concordia Commentary series, returns to write this forthcoming volume. He extends his work from 1 Samuel, building off that commentary to deliver an exceptional theological analysis of this text. Steinmann seeks to translate the original Hebrew text in a way that maintains the integrity of the original words and constructions, with consideration of the ancient versions, rendering the meaning of the chosen text into idiomatic English. In addition, he takes into account the historical nature of this narrative, identifying when and where specific events took place. The Book of 2 Samuel continues the story of King David, and Steinmann reminds readers that this story is also a record of God’s love and mercy toward Israel and ultimately toward all humankind in the Son of David, Jesus Christ. Download a free excerpt from 2 Samuel by filling out the form below.